For other uses, see Nanning (disambiguation). Nanning, an ancient city with a long history and rich culture, was part of Baiyue ethnic groups in the ancient time. In the first year of Daxing period of Eastern Jin Dynasty (AD 318), Jinxing County, established here as one of the county towns, ushered a history of 1700 years of Nanning organizational system. 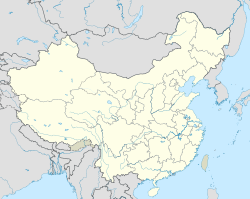 During the Zhenguan period of Tang dynasty (AD 632), it was renamed Yong prefecture (Yongzhou) and established Yongzhou government seat, which is why it has been called Yong for short. In the first year of Taiding period of Yuan dynasty (AD1318), Yongzhou was renamed Nanning, meaning the Pacified South. Nanning was once the territory of the Baiyue people and became the capital of Jinxing Prefecture which was separated from Yulin Prefecture of the Eastern Jin Dynasty. In 1076 during the Lý–Song War Yongshou was besieged by Lý forces. Under the leadership of Su Jian, the garrison held out for forty-two days before succumbing: The city was razed to the ground and its people massacred. In the Yuan dynasty in 1324, it was renamed Nanning Lu (Nanning Circuit) of Yongzhou. Historically, Nanning was famous for trade, and had permanent business offices from other areas in China since the Song dynasty. In the Ming dynasty Nanning developed into an economic center of the Zuo River and the You River with the reputation of "Little Nanjing". On December 4, 1949, Nanning was captured by the CPC; in January 1950, Nanning municipality was set up, and identified as the capital city of Guangxi on February 8 of the same year; in March 1958, the Guangxi Zhuang Autonomous Region was established, and Nanning municipality was the capital city. Nanning serves as host for the annual China-ASEAN EXPO (CASEAN EXPO) which began in 2004 and was the venue for the 2006 "World Robotics Olympiad". 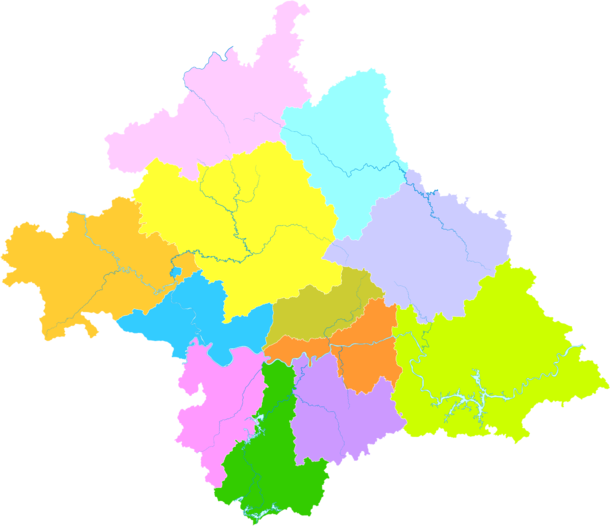 Nanning has jurisdiction over 7 districts, 5 counties, and 6 development zones. Nanning is home of the 21st tallest building in the People's Republic of China, the Diwang International Commerce Center, at 276 m (906 ft), currently the tallest building in Guangxi and southwestern China (excluding Chongqing). The second tallest building in Nanning is the World Trade Commerce City at 218 meters. The city currently has seven buildings taller than 100 m (330 ft), built or under construction. Nanning has many parks with tropical lush green landscape, it is one of the "greenest" cities in China, and it's known as "Green City"(绿城). 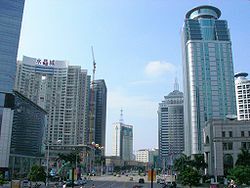 Nanning's downtown skyline is rapidly changing and the city is becoming an important hub in China. Recently, the government has begun a citywide beautification plan which aimed to further clean up the city and improve its image. This involved curtailing the number of street-side food vendors operating without proper licenses and restricting parking in busy streets. The program has achieved initial success, long-term efforts are still needed to deliver lasting results. Nanning's GDP in 2015 was 341 billion RMB. The GDP per capita was $7,844. Foreign exports in 2007 were 10 billion USD. Foreign fixed asset investment was 34.3 billion RMB. Nanning has six development zones and industrial parks, three of which accounted for 6 billion RMB of Nanning's GDP, more than 8 percent of Nanning's total. Mineral resources include gold, iron, manganese, aluminum, quartz, silver, indium, coal, marble, and granite. One third of China's different types of mineral resources are found in Nanning. Nanning Metro system is known for its Nanning Rail Transit (NNRT), expected to comprise a total of nine lines. The first has been completed and put into operation in June 2016, while lines 2, 3 and 4 are now under construction. Line 1 connects the East and West of Nanning, linking the financial and political center and the academic and research center of Nanning. Stations of Line 1 from the West to East are: SHIBU - Nanning College for Vacational Technology - PENGFEI LU - XIXIANGTANG Coach Station - Guangxi University for Nationalities - QINGCHUAN - Nanning Zoo - LUBAN LU - Guangxi University - BAICANGLING - Nanning Railway Station - CHAOYANG Square - XINMIN LU - MINZU Square - MACUN - NANHU - JINHU Square - Convention & Exhibition Center - WANXIANGCHENG - ASEAN Business District - FENGLING -!LANGDON Coach Station - BAIHUALING - FOZILING - Nanning East Railway Station. 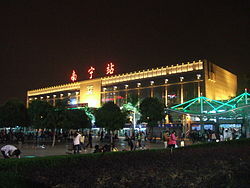 Nanning railway station is a railway junction for the Nanning–Kunming, Nanning–Guangzhou and Hunan–Guangxi Railways. There are also plans to build a high-speed railway to Pingxiang on the Vietnamese border. The goal is to better integrate Pan-Pearl River Delta and southeast China with members of the ASEAN. At the end of 2013, some high-speed service has been introduced on the Hunan–Guangxi railway and on the railway line that connects Nanning with Beihai (as well as its branch to Fangchenggang). Guangxi is also a conjunction of Guangdong-Guiyang Highspeed Rail. Nanning's warm climate gives it a large amount of biodiversity. There are many species of animals and more than 3,000 species of plants. The city flower is the Jaba flower, an evergreen shrub, and the city tree is the almond tree which is regarded as the backbone tree used for greening and landscaping throughout the city. Nanning is located in the southern part of the Guangxi Zhuang Autonomous Region, 160 km (99 mi) from the border with Vietnam. It has an administrative area of 22,293 km2 (8,607 sq mi). Nanning is situated in a hilly basin with elevations between 70 and 500 m (230 and 1,640 ft) above sea-level. Qingxiu Mountain dominates the southern part of town. Nanning has a warm, monsoon-influenced humid subtropical climate (Köppen Cwa), with an annual mean temperature of 21.83 °C (71.3 °F). Summers are hot and humid with July, the hottest month, having a 24-hour average temperature of 28.4 °C (83.1 °F). Winters are mild and somewhat damp with January, the coolest month, averaging 12.9 °C (55.2 °F). From February to August, rain is most frequent and relative humidity consistently averages above 80 percent; the annual rainfall is 1,290 millimetres (50.8 in). The area is also frost-free for all but 3 or 4 days a year and snowfall is virtually unheard of in the city, with a unique exception since 1900: in December 1975 snow fell on the city albeit without sticking to the ground. Extreme temperatures have ranged from −2.1 to 40.4 °C (28 to 105 °F). With monthly percent possible sunshine ranging from 17 percent in March to 51 percent in September, the city receives 1,585 hours of bright sunshine annually. At 2010 census, the total population of Nanning was 6,611,600, among which 2,875,220 were urban residents (after the adjustment of administrative divisions) and 2,480,340 in the built up area made of 5 out of 6 urban districts. 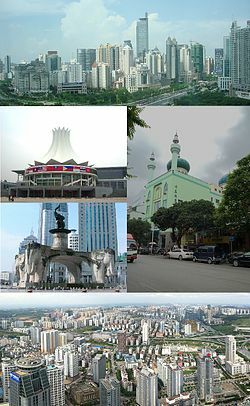 Nanning is a city in which Zhuang ethnic group live in compact communities. 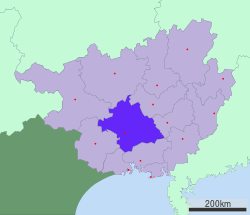 Thirty-five ethnic groups live in compact communities in Nanning, including people of Zhuang, Han, Yao, Hui, Miao, Dong, and Man minorities. Nanning is the center of science and technology, education, culture and health in Guangxi Zhuang Autonomous Region. There are altogether 54 scientific research institutes subordinate to districts. 10 colleges and 50 trade schools are training specialised personnel of all kinds. Now there are 62 mass cultural organizations, 13 performing groups, 8 cinemas, 285 projecting units, over 70 karaoke halls and over 1000 newsstands. Bookshops and cultural markets can be found everywhere. Nanning has not only local cuisine but also food from other areas of China and abroad. Traditional food culture can be found around most streets of Nanning. Nanning food shares the style of Cantonese food and of Southeast Asia. Chinese cuisine including Guangdong, Sichuan, Hunan and Jiangsu as well as Japanese, Thai and Western cuisines can be found. Rice noodles are very popular among the Nanning people. Laoyou rice noodles are the most famous, while other noodle dishes such as Guilin rice noodles and hand made noodles can be found. Laoyou rice noodles (means old friend rice noodles) are made of fry up pepper, sour bamboo shoots, black beans and garlic, then pork, and then soup and rice noodles. The sour-spicy tasting noodles are a very popular and cheap favorite street food for all meals (breakfast, lunch and dinner) in Nanning. Wikivoyage has a travel guide for Nanning. Nanning is close to scenic Guilin, with its world-famous hillscape, northern and western Guangxi and its minority villages, and the border with Vietnam in the south. Tourist attractions in Nanning include Guangxi Museum, People's Park with the Zhenning Fort, Mount Qingxiu, Guangxi Medicinal Herb Botanical Garden, and Yangmei Ancient Town. Other places of interest include Nanhu Park, Shishan Park and Nanning Zoo. ^ "Illuminating China's Provinces, Municipalities and Autonomous Regions". PRC Central Government Official Website. Retrieved 17 May 2014. ^ 3-5主要年份各市按居住地分的城乡人口(2005-2014年)-数析网. www.tjsql.com. Retrieved 6 March 2016. ^ 艳梅, 黄; 志雄, 杨 (25 March 2008). 2007南宁市GDP总量首次突破一千亿元人民币. 中新广西网 (in Chinese). Retrieved 23 July 2015. ^ "High-speed railway to boost trade". Retrieved 19 February 2011. ^ "China starts construction of Nanning-Guangzhou high-speed rail line". Xinhua. 9 November 2008. Retrieved 28 August 2010. ^ 广西再开通运营9对动车组 陈武宣布高铁开通 [Guangxi opens new CRH service, with 9 pairs of train a day. Chen Wu announces the opening of high-speed service]. huochepiao.com. 31 December 2013. ^ "Profile of Nanning" (in Chinese). Archived from the original on 10 June 2008. Retrieved 11 June 2008. ^ a b "Extreme Temperatures Around the World". Retrieved 21 February 2013. ^ 中国气象局 国家气象信息中心 (in Chinese). China Meteorological Administration. Archived from the original on 16 July 2009. Retrieved 4 May 2010. ^ 中国气象数据网 - WeatherBk Data. China Meteorological Administration. Retrieved 9 November 2018. ^ China's Southwest. Lonely Planet. 2007. p. 192. ISBN 978-1-74104-185-9. Wikimedia Commons has media related to Nanning. ¹ — Taiwan is administered as a streamlined province by the Republic of China, but claimed by the PRC. This page was last edited on 24 April 2019, at 13:07 (UTC).